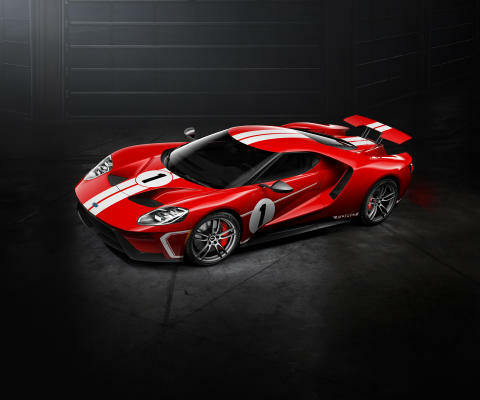 COLOGNE, Germany, Aug. 15, 2017 – The Ford GT will be available in a new limited-edition Heritage theme honouring the GT40 Mark IV race car driven to victory by Dan Gurney and A.J. Foyt at Le Mans in 1967. 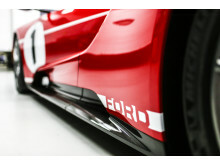 The car will feature unique interior and exterior colour themes, and an exclusive wheel finish. 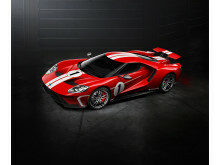 The Ford GT ’67 Heritage edition features a gloss-finish Race Red exterior with white stripes and exposed carbon package. The car sports Frozen White No. 1 hood and door graphics, and 20-inch one-piece forged aluminum wheels in silver satin clearcoat with black wheel nuts. Red callipers and silver rearview mirror caps complete the look. The interior features new leather trimming for the carbon fibre seats, with red accent stitching, which carries over to the steering wheel. The seat belt webbing is now red and the paddle shifters are anodised grey. Satin dark stainless appliqués are used on the instrument panel, door register bezels and x-brace. Rounding out modifications to the ’67 Heritage edition car are a unique serialised identification plate, plus exposed matte carbon fibre door sills, air register pods and centre console. 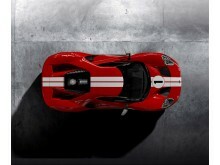 The Ford GT ’67 Heritage edition can be viewed at FordGT.com using the configuration tool. Limited quantities will be available for the forthcoming model year. I år er det 50 år siden Ford GT’s berømte 1-2-3 sejr ved Le Mans i 1966. I den anledning gjorde Ford comeback ved verdens største racerløb, og Le Mans 2016 var en begivenhed, der på mange måder blev historisk for Ford. 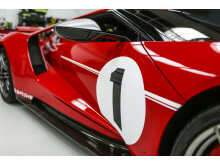 Den nye Ford GT præsterede fremragende, og Ford endte på en 1., 3., og 4.-plads. ​Selvom det ikke er os alle der har råd til drømmen om at eje en Ford GT, kan du nu komme helt tæt på med det nye Ford GT LEGO Speed Champions sæt. I år vil holdet bag Ford Chip Ganassi Racing tage udfordringen op til 24-timers løbet Le Mans for at forsvare sidste års sejr. Hurtigere end en Ferrari og McLaren? Med en målt topfart på 347 km/t er den nye Ford GT hurtigere end sine konkurrenter i Calabogie Motorsports Park i Canada. 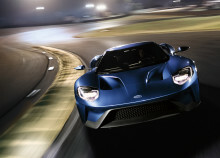 Den nye Ford GT er skræddersyet fra top til bund. Med en uovertruffen aerodynamik og nye teknologier fungerer den også som testbil for Fords mange innovative idéer. Ny Ford Mustang, EcoSport, Ranger Black Edition og Tourneo Custom bliver præsenteret på Frankfurt Motor Show i næste uge.